The core business of our research laboratory is to solve complex physico-chemical problems in materials science. The infrastructure of our laboratory includes dedicated research set-up for studying flow behavior, shear, cohesive character of powders, dustiness, attrition and strength of particles, wettability and mixing and segregation of powders. Our research laboratory furthermore employs a wide variety of more fundamentally oriented physical characterization techniques with particular emphasis on specific surface area of solids, adsorption, porosity and pore size analysis, density, chemical composition and particle size of solids, but also sprays and aerosols. The majority of our mythologies can be executed according to various ASTM or ISO standards and on customers’ specification. 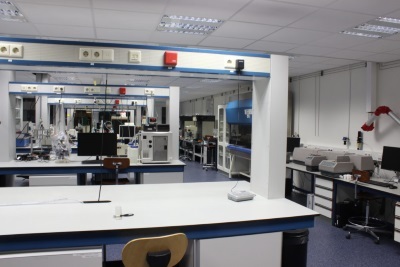 With our well-equipped laboratory we can guarantee high throughput of samples and short turnaround times of typically less than 10 working days in case of analysis services. In addition to our recognized expertise in the field of adsorption and particle size measurements, we also execute research activities on the design and synthesis of hierarchical porous materials, in order to make a more efficient usage of these materials in adsorption and catalysis.